The sky over Huginnin Cove looked stormy when we got up at 7:30 am. We decided to skip breakfast since the hike back to Windigo was only about 4.5 miles along West Huginnin Cove Trail. We packed up quickly under the threatening sky and left at 8:30. We were sad to have to leave this wonderful place and would have loved to stay another day, but the weather continued to be consistent in its unpredictability, and we felt that heading back toward Windigo to be prepared in the event of more flight issues was the smarter thing to do. Anyone visiting the west end of Isle Royale should definitely visit Huginnin Cove; it's worth the short trip. We departed the cove via West Huginnin Cove Trail, which heads south into the woods and is not nearly as interesting as its east counterpart. There are a few climbs and descents along this trail, as it traverses three different ridges. Like the east trail, WHCT eventually meets up with the Minong Ridge Trail, which leads back to Washington Creek Campground and Windigo. We were climbing a ridge near the intersection with the Minong, when Craig suddenly stopped in front of me and motioned for me to be quiet. A female moose and her two calves were slowly making their way through the brush a short distance in front of us, heading west along the side of the ridge we were climbing. 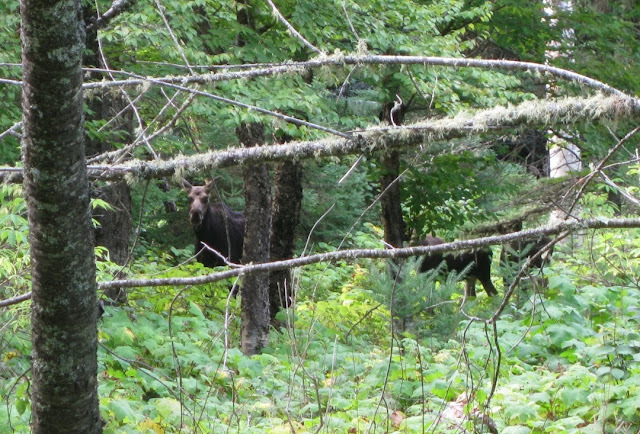 We watched them through the thick brush, until they were mostly hidden in the woods off the trail to our right. Once we continued climbing the ridge, the cow moose heard us and then it was her turn to people-watch. We could barely make them out; the two small calves were hidden behind trees near their mother, who stood watching us intently. We continued on, happy to have finally seen our first moose of the trip. We reached Windigo at 10:40 am and checked in with Ranger Valerie to see what the weather forecast had to say, and to see what the chances were of flying out today rather than tomorrow as planned. Neither of us really wanted to cut the trip short, but we also didn't want to push our luck given the weather and flying conditions of the last few days. It turned out that the plane was not flying, because no flights had been booked on this particular date. The decision was now out of our hands; we would stay another night at Washington Creek and attempt to leave tomorrow as originally planned. Whatever was going to happen would happen. Someone at Windigo said that wolves were heard the night before by people camping at Washington Creek, which was exciting news. A fox trotted by us as we headed back down the path to the campground. We settled in at Shelter #9, which had a good view of Washington Creek. It was cold and breezy; the sun tried to penetrate the clouds but was unsuccessful, and the heavy cloud cover remained all day. After making lunch, we watched ducks swim back and forth in the creek and then took a nap. Except for the occasional gust of wind or bird call, it was completely silent. Around 6:00 pm, we took a walk to Washington Harbor. Earlier in the day at Windigo, we had seen a few park rangers looking like they were responding to something urgent. We now learned that a sailboat that was out in the harbor had started to sink – the Coast Guard at Rock Harbor was alerted, and the rangers we had seen at Windigo were heading out to help pump water from the boat and begin rescuing those on board. We would learn more details the following day from one of the stranded boaters. Peril on the high seas (lake)! What is this fox doing? 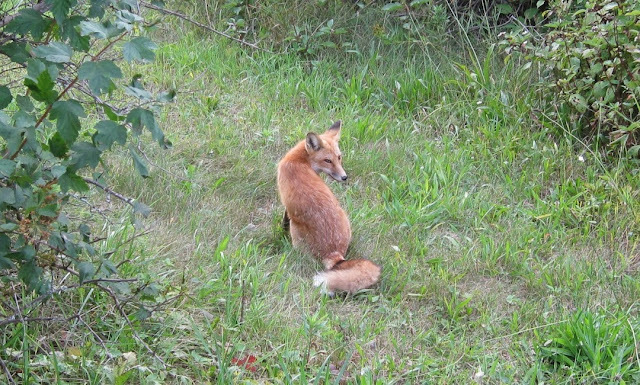 On the way back to our shelter, we passed a small clearing just offshore, where a fox was having dinner. 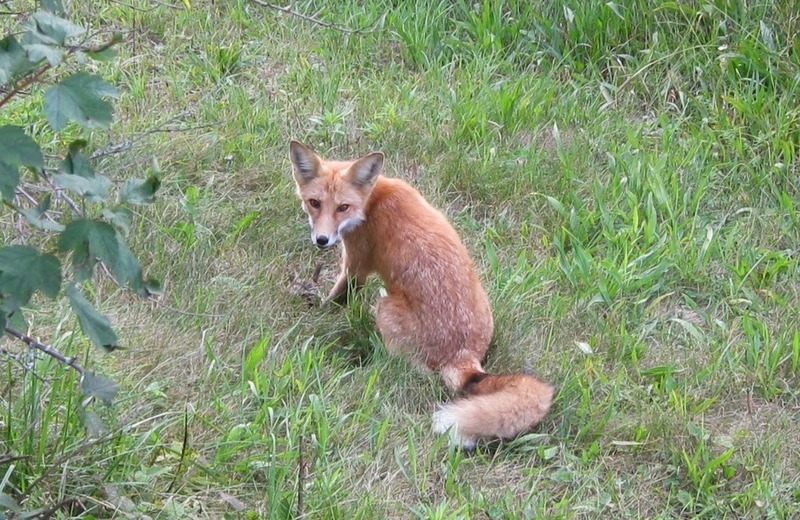 It had caught a bird and was sitting in the clearing eating it. It did not seem too concerned with our presence, and we watched it for a minute or so from around 10 feet away as it worked on its meal. Oh, I have an audience. It had been chilly all day, but the temperature dropped significantly as the sun went down. We went to bed at 8pm because it was too cold to do anything outside of a sleeping bag. Unfortunately, the weather forecast we had looked at earlier did not predict the temperature dropping to the mid-30s in the middle of the night. If we had known about this, we would have put our tent up inside the shelter to benefit from the retention of body heat. Instead, we hunkered down into our sleeping bags on the shelter floor, anticipating a chilly night in the 40s. To be continued in Day 8: What will the weather bring?